The Abby Aldrich Rockefeller Folk Art Museum in Williamsburg, Virginia, is hosting “A Century of African-American Quilts,” an exhibit of 12 hand-sewn quilts crafted by African American women, half of which have never been displayed publicly until now. Made from a variety of materials, including cotton, silk ribbon, beads and colorful threads, the quilts are on display at the Foster and Muriel McCarl Gallery through May 2018. The exhibit showcases a varied collection of colorful bed covers that display many cultural influences and artistic sensibilities, as shown in the slideshow in The Daily Press. Some, such as the quilt sewn by former slave Anna Jane Parker around the turn of the century, closely resemble the log-cabin quilts that were popular during the American Civil War. Others appear both symbolic and whimsical. The multicolored quilt by Dora Smith of DeKalb County, Georgia, for example, employs a pattern of circles containing alphabet letters that spell out the names of her children and the words “boys,” “girls,” “cats” and “dogs.” These are surrounded by iconic depictions of human figures, human hands, a snake, stars and moons. Another group of quilts on display at the Folk Art Museum are from the small, impoverished Alabama community of Gee’s Bend, where black women have been heralded for their unique quilting style for many years. 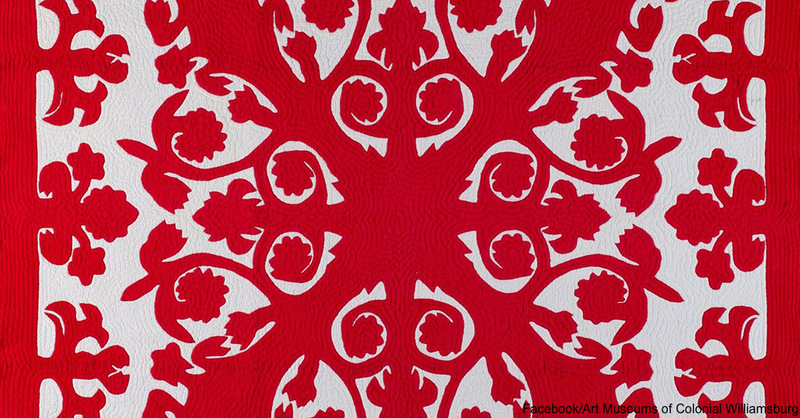 First displayed in 2003 at the Museum of Fine Arts in Houston, Texas, the Gee’s Bend quilts have also been shown at the Whitney Museum in New York, where they were recognized as exceptional contributions to the world of modern art. “A Century of African American Quilts,” is part of a larger effort on the part of the The Colonial Williamsburg Foundation to honor the artistic contributions of African-Americans. It opened on Jan. 1, 2016, in commemoration of Black History month. The African-American quilt-makers of the American South have long been recognized as some of the country’s most skilled and imaginative artisans. For four generations, these deeply impoverished women used scraps of fabric and thread to craft utilitarian bed covers that were also stunning works of art. The 12 quilts on display at the Rockefeller Folk Art Museum provide just a tiny glimpse into the talents of these amazing women and the rich and varied symbolism embodied in their work. Learn more about the history of African American quilt-making to gain greater insight into their lives.